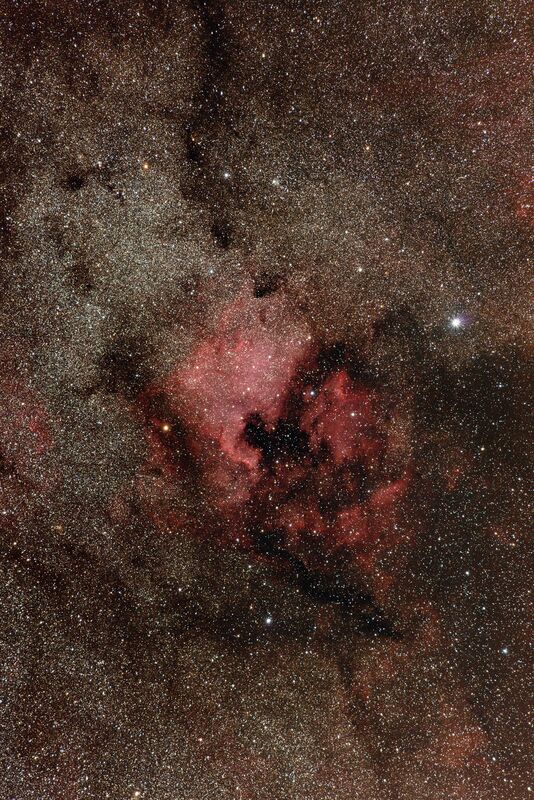 Click the button below to add the STC Astro-Multispectra Clip Filter (Nikon Full Frame) to your wish list. STC Astro-Multispectra Clip Filter for Nikon full frame bodies is a novel light pollution filter designed by STC Optics with transmission characteristics designed by professional astronomer and renowned astrophotographer Dr. Wei-Hao Wang. 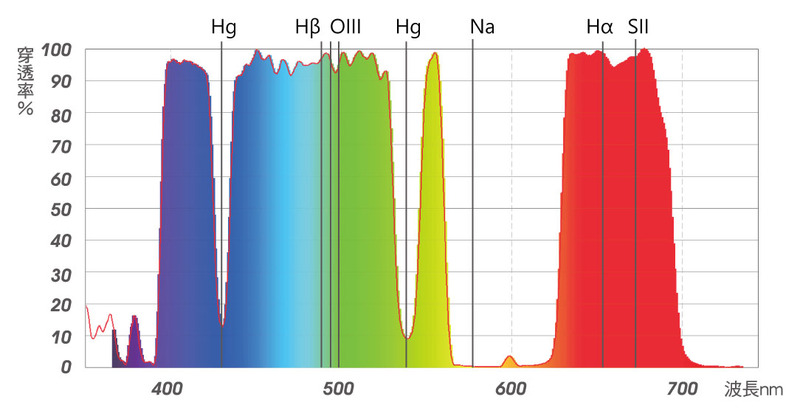 Check out the comparisons below to see how effective the Astro-Multispectra filer is! 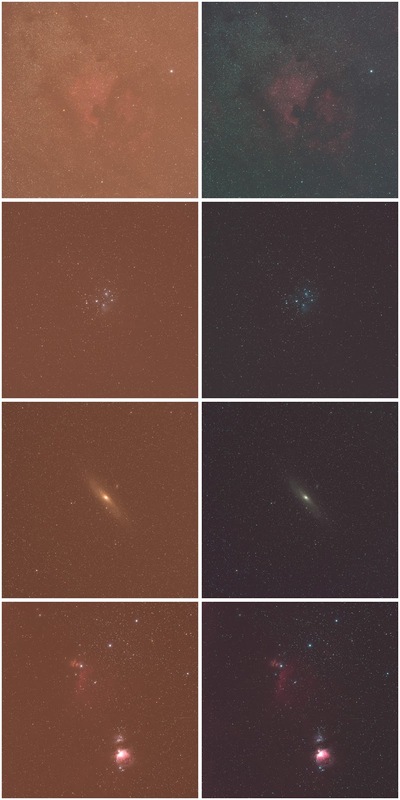 Placing the light pollution filter closer to the sensor reduces color shift that may occur at the peripheral areas of the image if front screw-in lens filter is used. **Nikon users who will only use the camera with telescopes are encourage to use the 48mm version of STC Astro-Multispectra filter. Clip Filter is designed for Nikon Full-Format cameras. Mounting and removing the Clip-Filter is quick and easy. The color shift problem that may occur due to the wide angle SLR lens in peripheral areas of the image could be reduced. The recommended SLR lenses focal length is 14mm or longer on full frame bodies. The material is A2 stainless steel which is virtually non-magnetic and less brittle at low temperatures. Specially designed Clip-shaped structure could be pressed firmly while attaching the lens on camera body. Considering the different optical lens properties of all kinds of brands, it is normal for spherical and coma aberration to occur on part of the fisheye lens, super wide angle lens and wide angle lens. High transmission for astronomical bodies emission at Hα=656.3 nm, Hβ=486.1 nm, OIII=495.9 & 500.7 nm, SII=672.4 nm and slightly passing yellow-orangish emission at 605nm. Where does the clip filter go? The clip filter sits nicely on the cavity in your camera body, before the mirror. It doesn't get in touch with the sensor at all. Will the mirror damage the filter or vice versa? No, when the clip filter is in place, the mirror will rest on the clip filter frame which is made of 304 stainless steel and padded with shock absorbing material. Is it okay to release the mirror lock? Absolutely! There is no harm to be caused to the mirror or the filter. It's perfectly fine to leave the clip filter in the body even when powered off. A. Select LV (liveview mode) after turning on the camera. The mirror will lock up and then remove the lens. B. Slide the Astro-M clip filter at an inclined angle of 45º into the camera as shown below. 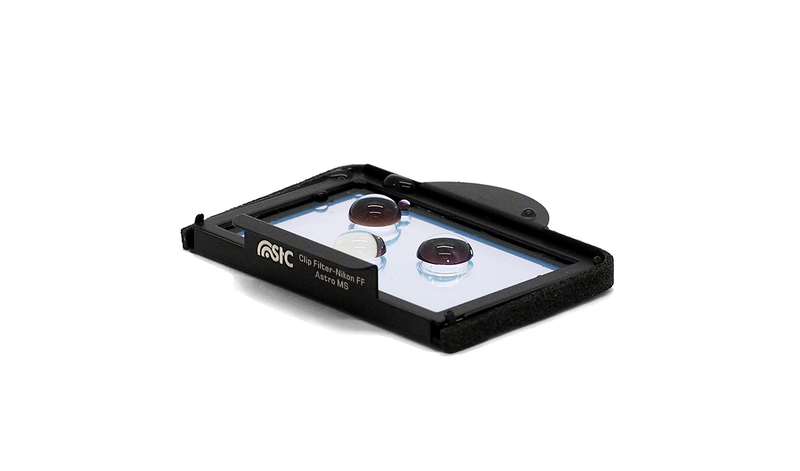 STC utilises ion beam assisted deposition (IBAD) to solidly bind the coatings onto Schott B270 glass, the very same glass used in Zeiss lenses. Such technique enhances the light transmission and also durability of the 160 layers of coating deposited to produce the advanced filter characteristics shown above. With patented Ultra Layer® technology, both surfaces of Astro-Multispectra are coated with Anti-Smudge nano-coating to prevent dust and water from settling on the filter surface. Dew will not form and your filter is always clean. If necessary, it's effortless to clean. Extended to 12 months by registering on STC website. 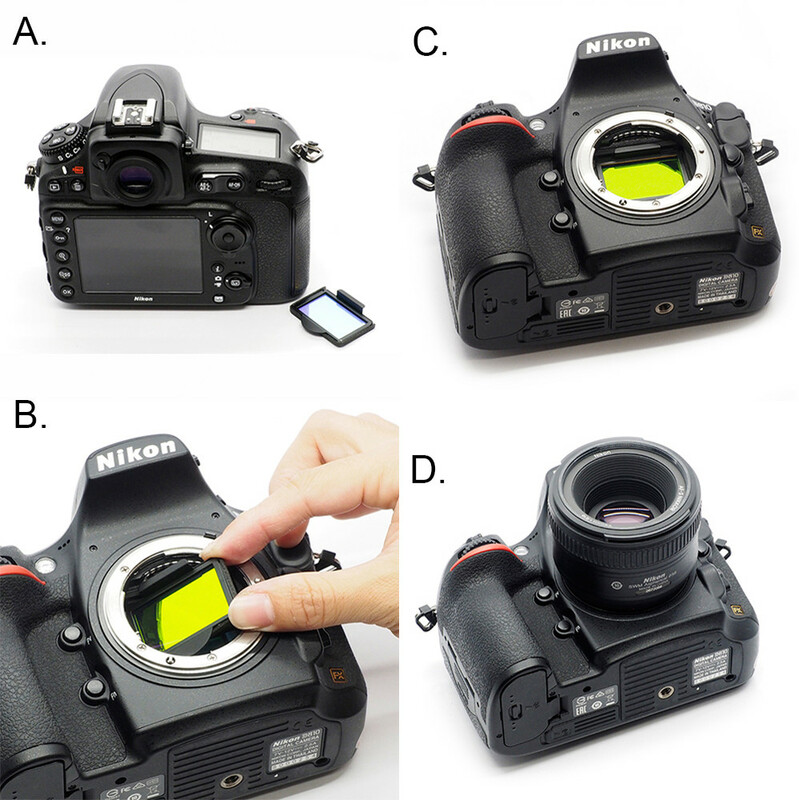 專為Canon與Nikon全幅機所設計的內置型濾鏡Clip Filter，裝置在相機機身內部，除了方便使用各式鏡頭裝上機身使用，還能減少在廣角鏡頭產生光譜偏移的狀況，14mm*以上的鏡頭焦段皆能正常拍攝星空。採用無磁性的304不鏽鋼材質沖壓成形製作，獨家專利簧片設計可在裝上鏡頭的同時，安穩地固定濾鏡的位置，不會因晃動而影響焦平面偏移。 It is designed for Canon and Nikon Full-Frame camera body mount, and reducing the color shift that may occur due to the wide angle SLR lens in peripheral areas of the image. We recommend using STC Clip Filter with SLR lenses focal distance of 14mm or more, and avoiding directly taking pictures to strong artificial light which causes slightly flare on image. 【安裝步驟 Installation Procedure】 1. 於乾淨無風的環境，移除鏡頭，開啟電源，選擇Live View(即時顯示)模式，反光鏡會自動升起。 Choose a clean space without wind. Turn on the power and press LV (Liew View) button. The mirror locks up and remove the lens. 2. 將內置型濾鏡傾斜約45度角放入，確認內置型濾鏡已經完全平放於感光元件前方。 Slide in the Clip filter into camera mount, and make sure the Clip Filter is stable. 3. 裝上相機鏡頭，即可拍攝(需使用Live View模式拍攝)。 Attach the lens on.